] on Wednesday, October 24th at St. Mary’s (see below). It is being hosted by StandUp Blue Springs and St. Mary’s Hospital. This is one of a series of COMBAT town hall meetings regarding the storage, use and disposal of prescription medications; the others are not in Blue Springs. prescription and over-the-counter drug abuse. Click Here for the Special Election Notice for November 8th. the Jackson County Legislature has called a Special Election, pursuant to Ordinance Number 4334, to be held in said County on Tuesday, November 8, 2011. The polls will be open from 6 a.m. until 7 p.m.
Shall a retail sales tax of one-eighth of one percent (1/8%) be levied and collected for the benefit of the Kansas City Zoological District, which shall be created and consist of the county of Jackson and the counties of Cass, Clay, and/or Platte, if approved by such other county’s voters, for the support of zoological activities within the district? One of the most important tasks of a councilman is to weigh the evidence and to evaluate how each project fits the city’s plan. The City Council recently considered and approved a change to a controversial project, Parkway Estates, a housing development originally approved when I was on the council in 2006. As I watched the meeting, I experienced a bit of a déjà vu moment, as many of the same citizens were present to express their opposition to the changes requested by the landowner. I was proud of the entire council for the respectful manner in which they addressed the developer’s request and the citizen’s concerns. The council members invested significant time studying the issues and history surrounding this development, as well as listening and considering the points of view of the neighbors and constituents throughout the city. Evaluating a change to an existing development requires familiarity with the city’s comprehensive plan as well as the many development ordinances. It was clear from the meeting that our councilmen did their homework. As each councilman spoke of his reasons for voting either for or against the request, their commitment to their position and to the integrity of their oath of office was apparent. Each drew from their own experience and evaluated the developer’s request based on what they believe is best for the City of Blue Springs, and I applaud their honesty and dedication. A friend who has lived in Blue Springs longer than I have shared that when the Timber Oaks subdivision was completed, the developer came to the city for approval of an additional street, with the intent of building smaller patio homes. He stated that the neighbors came out in force, concerned that the new smaller homes would destroy property values, along with a variety of negative arguments to attempt to stop the project. Ultimately that project was approved and built. Today you would never know it was a separate project. These well-kept homes have been an excellent addition to the area, adding another choice of homes for buyers. The Parkway Estates project will bring quality homes to the city that fit the plan for the area. While the neighbors did not get all they asked for, their input into the process was vital to improving the quality of the resulting proposed project. Citizens with concerns should always participate in the process of project review. That is the purpose of public hearings. In the end, the council effectively evaluated the project and achieved a fair conclusion to the process. Watch the meeting at http://bit.ly/cc20101018. We are blessed to have a diverse and dedicated council in Blue Springs. One of them, Jeanie Lauer, has chosen to seek the office of State Representative in District 54. Jeanie has proven her leadership during her time on the council and will be a great advocate for our city and the other cities in District 54. I encourage each of you to remember to vote on November 2, and if you live in District 54, to cast your ballot for Jeanie Lauer. Wilbur Young Park Disc Golf Course a Success! 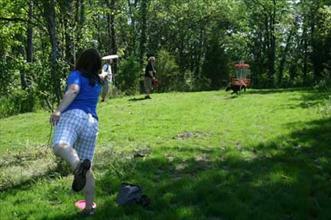 My name is Ken F. I have been playing disc golf for nearly 10 years and play this game professionally on the PDGA tour. I'm ranked in the top 70 in the world. I recently relocated to the KC (Midtown) area about 7 months ago. I've lived on both coasts and the midwest, played hundreds of courses around the country and Blue Springs is vastly becoming one of my favorite! I'm excited to have a league night now. I have friends that drive in from Topeka, just to play leagues on Wednesday evenings. Thank you for all your efforts and team work, working with John Theiss on this course!!! I am a local disc golfer from Overland Park and I had a chance to play the Young Park course a few weeks ago. I had a great time and the course, in my opinion, is one of the best in the metro already. I wanted to write the Parks & Rec Department to thank them for all their development and maintenance efforts thus far. It appears that the City of Blue Springs truly understands and believes in community strength. Makes me want to move east. I just wanted to let everyone know what a great job the Parks and Rec have done at Young Park disc golf course. I have received tons of compliments about the course. We have been running league at the course and we are getting folks from BS and LS and as far as 2 hours away. We had a Pro player that drove 2 hours just to play in the league because he loves the course. Pros are saying the this course is in their top three courses in KC. That is a huge compliment because Water Works DGC is one of the best in the world and Cliff Drive is also the most balanced course in the city. We are also getting some of the better players in the area out to play in the league which means they are skipping the other league held at Rosedale Park on Wednesdays. I am not sure what type of feedback that the parks dept is getting, but it has been overwhelming positive. Many folks that I have seen and spoke with are driving from downtown, North of the River , and Kansas to play. That is great news for the course and for Blue Springs. These people will stop and spend money in our town. Just wanted to send this because I am getting positive compliments from all types of players, beginners to pros . Keep up the great work BSPR. My name is Michael K., and I just wanted to let you all know what a wonderful job you did installing the disc golf course at Wilbur Young Park. My children attend William Yates Elementary where John Theiss was also instrumental with the small course that when into the school yard there, and that's how we first discovered this great sport. When we heard a course was being installed at Young Park, we were simply delighted! Now that the course is finished and we've had the chance to play it a few times, we could not be happier with how it turned out. The disc golf course at Young Park is one of the most beautiful and well-designed courses we have seen, and we are so excited to have such a world-class course within short driving distance from our home. Just one look at this course makes it apparent that the Blue Springs P&R department did it the right way, with close attention paid to all of the important details! Congratulations to the Blue Springs P&R and everyone else involved with this course on a job well done. Thank you so very much from the bottom of our hearts. I played in the Eastern Front event this past weekend and wanted to provide some feedback regarding the course at Young Park. Wow! You folks have really done things right out there. I have lived in Gladstone for close to 15 years and don't know that I have ever been to Blue Springs for anything in the past. I will be coming there on a regular basis in the future for league play and just to play the course casually. Area restaurants and such will be getting business from me. I consider the course there one of the best in the KC area and I know that others agree. John Theiss did a great job designing the course and it is obvious the Parks Department was on the ball in getting it ready. I heard that new grass was put down already since the tourney!! Thank you and I look forward to spending more time in the Blue Springs area. My name is Steve G. I am a member of the Kansas City Flying Disc Club with an uninterrupted 15-20 years of membership. I live in Ks. My drive time to the park is about 45 minutes. Its well worth the trip. I love all the water shots!!! First I want to thank the city for putting forth the efforts and getting the grants and making sure the project was first rate.The commitment I have seen put forth from the city on this project thus far has me really excited about revisiting this course because its only going to get better. I especially want to let you know how special John Theis and his family are. As you know there was a tournament there the day after the ribbon cutting ceremony. His wife, mother and father were all present helping run the tournament. Now here is the really impressive thing that happened during the first round. We guess one of the tee signs was missing a lock stud. It was breezy that day and the wind tore the sign off hole 7. When I reported it to John he immediately responded it was already fixed. His dad is a fix it guru and got the stuff needed to take care of the problem. The city should be thankful for all their sacrifices. I know I am. WHAT: All media is invited to attend a special Press Conference at the Centerpoint Medical Center Community Ice in which representatives from the Truman Heartland Community Foundation will unveil the recipients of the 2010 Heartland Humanitarian of the Year and Corporate Citizen of the Year. WHY: Executives from the Truman Heartland Community Foundation will announce this year’s top honorees during a community skate session at the Centerpoint Medical Center Community Ice. Award Recipients will be presented with a special gift from the General Manager of the Independence Events Center. At the conclusion of the presentation, Community Foundation personnel, Independence Events Center Staff and Honorees will be in available for interviews. A formal celebration will take place at the Community Foundation’s Annual Toast to Our Towns Gala on Saturday, September 25, 2010 at the Independence Events Center. WHERE: Centerpoint Medical Community Ice is located on the Southwest side of the Independence Events Center located at 19100 East Valley View Parkway, Independence, MO 64055.